The couple loves snorkeling and scuba diving so they knew they wanted a tropical location. Kerrie is a teacher and researches thoroughly, so at first, she was utilizing several destination wedding companies to find the right fit. Once she got in contact with Jessica, of Destify, she knew she had the right match. Kerrie said, “She responded so promptly, she was so on top of things”. 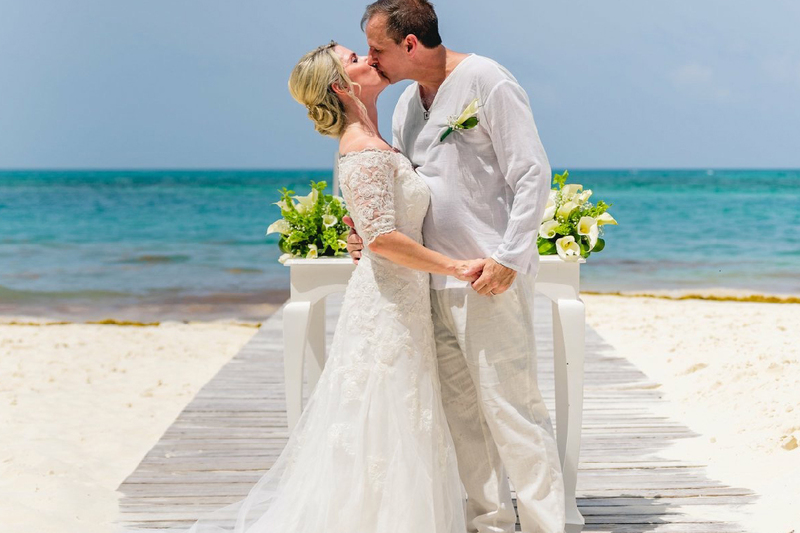 Together with Jessica, the couple chose the RIU Cancun all-inclusive resort. It had everything they were looking for, from budget-friendly room options to a great location. Their wedding coordinator turned out to be amazing and did everything just as they had requested. They planned to bring some of their own decorations, and the department did a great job coordinating it all for their big day. With 23 guests in attendance, the group took advantage of their location along the hotel zone. Most of their guests stayed on-site and for dinner several nights they met off-site amongst the exciting restaurants and nightlife downtown. The couple had to arrive several days early in order to have a legal wedding. Several witnesses signed paperwork, and a doctor made a room visit to take the couples’ bloodwork, a necessary requirement for civil ceremonies in Mexico. Kerrie’s sister suggested the couple host their ceremony on Facebook Live, so people who couldn’t attend were able to watch from home and leave encouraging comments. They hosted their ceremony on the beach, a Friday at 2pm. The couple picked out their own music, and ceremony decor included blue sashes on the chairs and blue rose petals adorning the aisle. After, the couple took pictures on the beach and along the resort’s dock. Later the couple held a cocktail hour, and a semi-private reception at the resort’s steakhouse, featuring some of their own personal decorations. Kerrie said, “They decorate, they clean up, you can’t beat it. Everything turned out exactly how we wanted it”. The next day the couple did a beautiful “trash the dress” photo shoot, where they took pictures in the resort’s pool and in the ocean. The couple agreed that getting married on the beach was so romantic, it was everything they had imagined. Kerrie has two bits of advice for future couples; communicate with your agent often, and invest in a good photographer to capture it all. They chose an outside vendor they had confidence in. John also set up a Facebook chat with their guests where they could share deals and updates before booking. You don’t need to spend money on all of the decorations, it’s beautiful as is.